Charulatha Mani is a leading Carnatic music vocalist and has a huge fan following in India and abroad. Gifted with a rich, melodious voice, and amazing creativity she has a vast repertoire of compositions of various genres, and this has made her one of the most popular and renowned artistes of today. 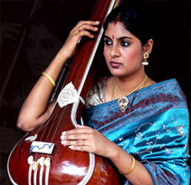 She initially trained under her mother Smt Hemalatha Mani, Veena artiste, and later trained under vidwans Sri Sandhyavananam Srinivasa Rao, and Calcutta K. S. Krishnamurthy. She regularly performs all over the globe, and has won several prestigious awards including the Yuva Kala Bharati from Bharat Kalachar, the Isai Kurasil from New Delhi and M S Subbulakshmi Endowment Award from Narada Gana Sabha, Chennai, Best Ragam Tanam Pallavi award from Krishna Gana Sabha. Her Isai Payanam programmes have made her a crowd-puller and the way she instantly connects with her audience and feel's their pulse have made her Isai Payanam home videos a must in every music lover's home. In Isai Payanam she presents ragas in Classical and Film music with examples from Classical and Film genres exuding the melodic feel and the raga's innate beauty. Her raga segment presentations for Jaya TV started off the Isai Payanam trend which she later carried over to live performances. She holds a Masters degree in Music from the University of Madras. Charulatha Mani is also a prominent Cine Playback singer with several super-hits in many south Indian languages to her credit. She also writes the column “A Raga's journey” for The Hindu newspaper which is widely read and appreciated.